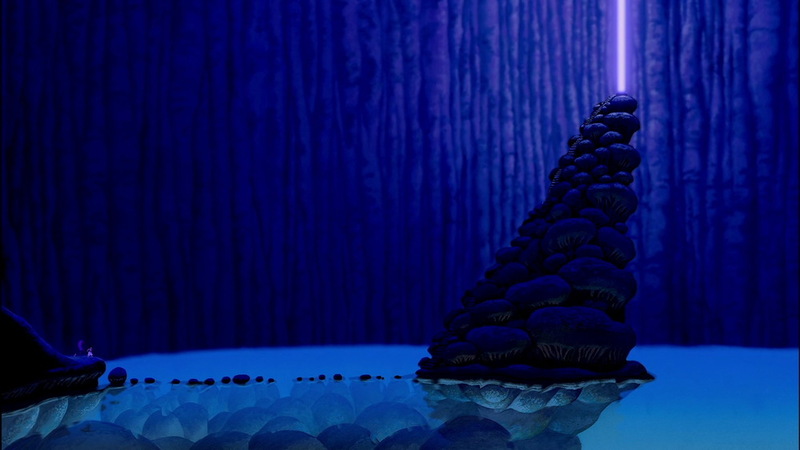 There are a ton of scenes that are primarily blue and some version of red or pink in this film. Which is wild because it takes place in a desert. It would have been easy to make everything dust or sand colored, but then it would have been less interesting. But they didn't throw the whole gamut of color on it either, because then that would have been distracting. No, they chose lots of blues and reds. And it feels right. Part of the design of the movie is not what you put in, but what you leave out. Greens were very lightly used in the film. There are some amazing compositions in this film. They're interesting and engaging and they create beautiful moments. Like this save-the-cat moment. There are so many things leading our eyes around from Aladdin to the children. We get a sense of what he's going to do next. Notice where Jasmine is in the study above? Right at the center of the spiral. Pretty cool, huh? Here are some other compositions that really stood out to me. 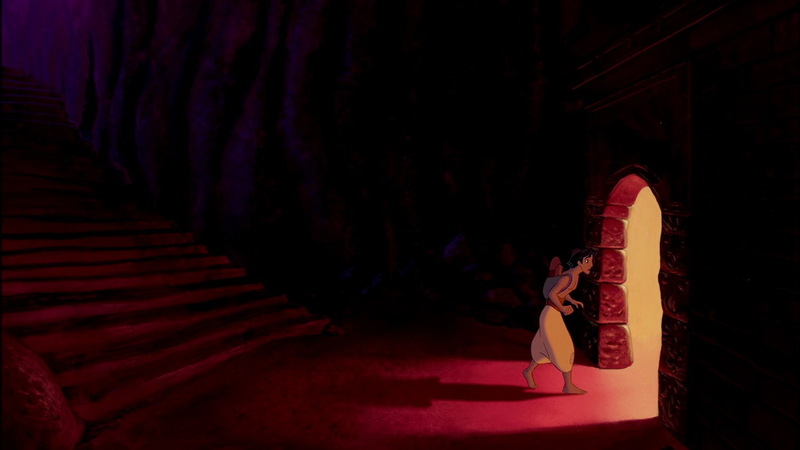 The shot below is when Aladdin shows Jasmine his digs. 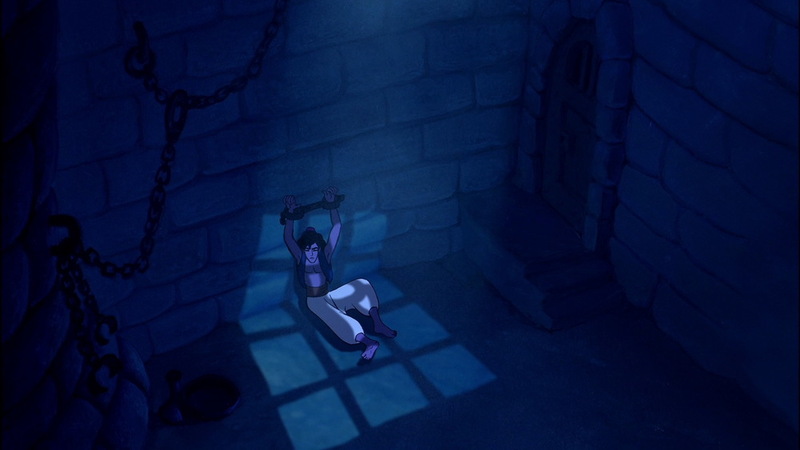 This is a huge moment because the 'feeling trapped' connection between Aladdin and Jasmine is absolutely vital to the story. Aladdin feels trapped by his own 'street rat' identity, living free on the streets and Jasmine feel trapped in the identity of princess living in the palace. Knowing all that, the composition of this shot is freaking amazing. Jasmine is sitting directly in front of the palace, which looms largely in the background, making Jasmine look smaller and pressured by it. Alternatively, Aladdin is surrounded by sky, but he's looking directly at the palace. It is a perfect setup for them to connect. The pinks and purples - beautifully romantic colors - definitely set the mood for two characters. It's shots like these, ones that combine the story with the placement of characters, and then set the mood with color, that make me love movies. Aladdin is one of the best films I've ever seen. The story, combined with the composition, design, color, acting (I can't really write a blog about Aladdin without bringing up Robin Williams' beautiful performance as Genie), and animation work together so incredibly well in this film. It's no wonder it is part of a Disney Golden Age.